The website Southfront.org is focusing on news on security issues, foreign policy, military analysis and reports on military hardware. According to the Mission Statement, the site is produced by a “team of experts and volunteers from the four corners of the Earth“. The site attacks the “Mainstream Media” for hiding the “truth behind the causes that provoke the various conflicts facing the world today“. The site is professionally designed and registered in Moscow, at the Domain Name Registrar Reg.ru. 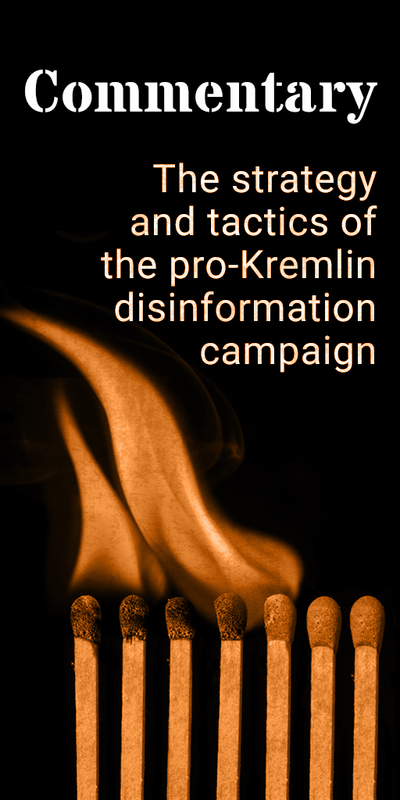 South Front is frequently featured in our database of cases of disinformation. In the summer of 2018, the site claimed Ukraine was planning a massacre on a EU delegation, visiting an area, close to separatist-held territories. Anything published on the South Front is carefully following the Kremlin Talking Points; for instance sharing verbatim the statement of the Russian MFA Spokesperson Mariya Zakharova on the fifth anniversary of the illegal annexation of Crimea. So, what’s the big deal with Russian sites sharing Kremlin official statements? What is interesting here is not Southfront’s loyalty to Russian state policies, but the fact that the site attempts to hide the fact that it is registered and managed in Russia. In a way, it works a little like money washing. 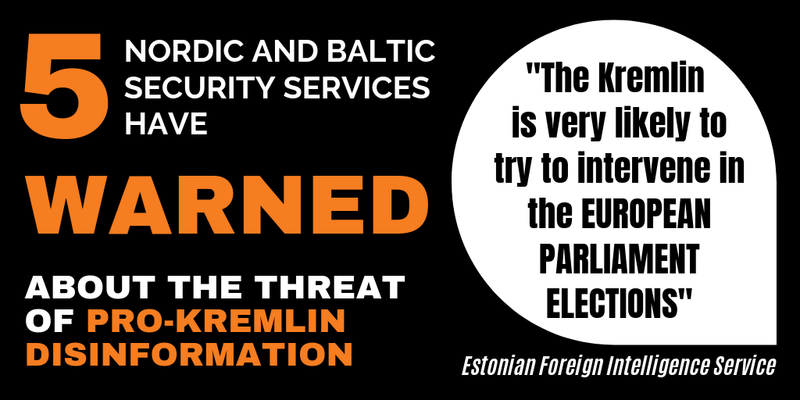 The use of the English language and of channels outside Russia makes the disinformation more appealing. Some of those relaying the stories might even be unaware of the Russian origin of the shared link. March 12 South Front.org published a video, labelled “Venezuela Blackout: Cyber Attacks, Sabotage and Mighty Intelligence“. Later the same day, the video appeared on Zero Hedge – a site generally devoted to news on economy and finance, but since 2014 has assumed a strong line of support to Russian foreign policy ambitions. Canadian conspiracy theory site Global Resarch was also quick to publish the video; so did the Libertarian The Daily Coin. Several other sites in other languages also published the South Front Video. A story about Moscow delivering a “Red Line Warning to Trump” appearing on a site, devoted to “alternative media”, marking the source of the text as Zero Hedge – signed by the pseudonym Tyler Durden. Zero Hedge gives South Front as its source, where we find out that the article originally was written for the Moscow based Strategic Culture Foundation. We can see how English Language websites, like South Front, New Eastern Outlook, Oriental Review and Strategic Culture Foundation, all based and managed in Russia, serve as a resource for “Alternative Perspectives” on current affairs. Looking for new approaches, angles and perspectives is fundamental in good journalism. And here it is: all material is free of charge – articles, videos, and infographics; nothing hidden behind nasty pay-walls, just copy-paste it to your own resource and you can create an impression of having heavy-weight contributors working for your site, offering something that appears to be challenging the “mainstream”. What do you mean, Russian? These sites seem as American as apple pie! RT and Sputnik do not hide their affiliation with Kremlin – both are official mouthpieces of Moscow; officially established and funded, generously, to advance “Russian perspectives” to an international audience. New Eastern Outlook, Oriental Review, South Front and Strategic Culture Foundation have another approach and target audience. There is a great deal of syndicated material: South Front stories appear, for instance, on Strategic Culture Foundation and vice versa. Some of the sites have signed articles, which allow us to follow this network further – Russian Scholar Leonid Savin is one of the main contributors to the Oriental Review. He is also Chief Editor of the Geopolitica.ru website and a contributor to the Kaheton.com. These two latter sites are managed by the influential nationalist oligarch Konstantin Malofeev, who also runs the nationalist Tsargrad Web-TV-channel. 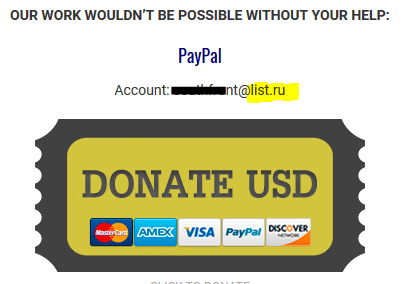 The sites’ contributors appear on RT and Sputnik, as “independent, international experts”. An example of this pattern can be followed here: An expert from Strategic Culture Foundation has a story shared with South Front. We can see him on Sputnik and on RT and at a site, managed by a RT host. The network can be followed literally all the way to the gates of the Moscow Kremlin. So how big is the influence of these sites? There are several different ways of establishing the impact of a site. With the web tool SimilarWeb, statistics on websites can be quickly obtained. 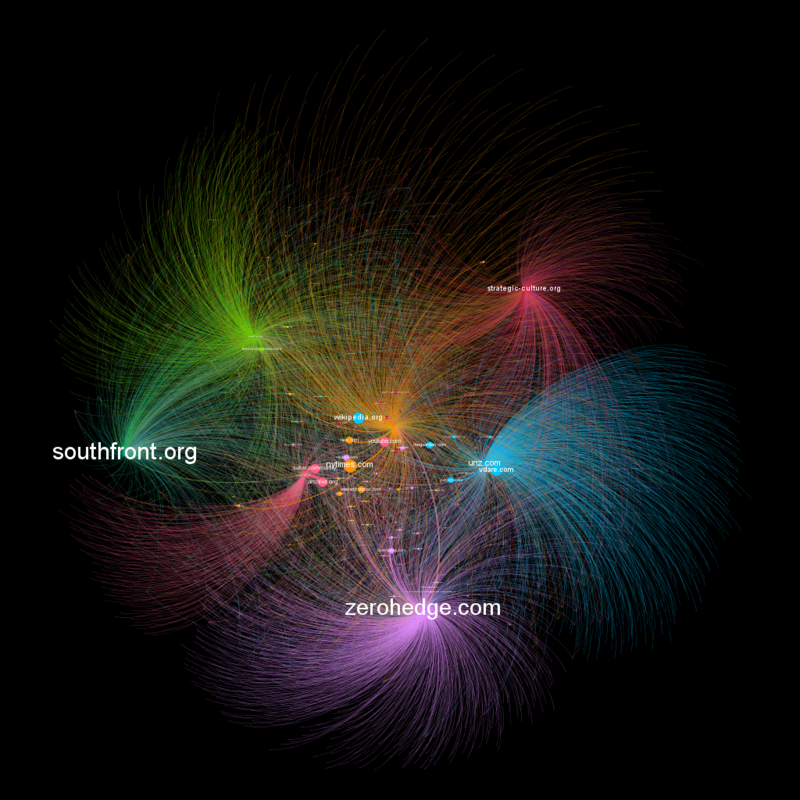 We find, for instance, that South Front is among the 46,000 most popular sites world wide. It has its largest audience in Germany, over 13 percent, likely because of a well-managed German version of the site. The other Russian sites in this overview dwarves in comparison: Strategic Culture Foundation ranks 120,000, New Eastern Outlook – 148,000 and Oriental Review – 906,000. The sites referring to South Front is often much bigger: Zero Hedge has almost 40 million visitors per month, Global Research – 2 millions, The Daily Coin – 150,000. We have done a rendition of South Front’s connections to other sites: which sites South Front is linking to and which sites is linking to South Front. We can see how South Front has emerged, together with a similarly Russian site, the Strategic Culture Foundation, into a network of American sites. So how Russian is South Front? The site is registered in Russia, but theoretically, anyone can register a site anywhere. 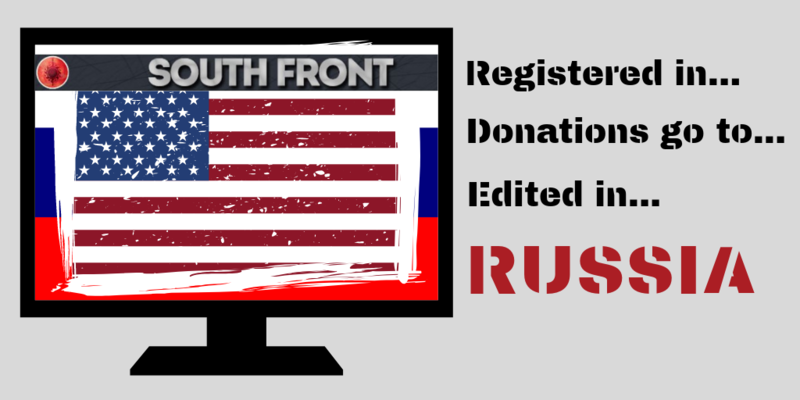 In short – South Front is registered in Russia, money, donated to the site goes to Russia and the editor is named Anastasia. But the most compelling evidence for South Front’s being Russian is in the content. South Front is not an alternative website, challenging the mainstream, corporate media. South Front is loyally relaying whatever suits the Kremlin, pretending not to be Russian.